Phillips Murrah Director advises Oklahoma Agricultural Aviation Association on potential crop dusting legal issues - Phillips Murrah P.C. Director Patrick Hullum speaks at the Oklahoma Agricultural Aviation Association annual convention. 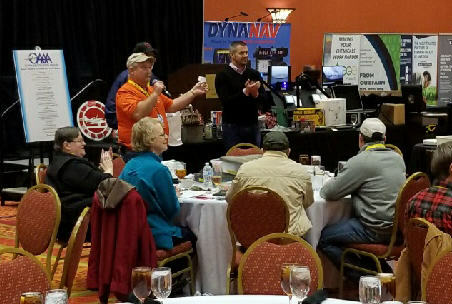 Phillips Murrah Director Patrick L. Hullum spoke to aerial spray applicators, or crop dusters, on January 16 at the Oklahoma Agricultural Aviation Association’s annual convention about potential legal issues facing these business owners and pilots and ways to avoid them. The aerial spray company must be allowed access to the property to view alleged damage, inspect and obtain samples for testing. The Department of Agriculture will conduct a complete investigation of any complaint and make a determination of whether the company committed any violations. The complainant may still file a lawsuit following the Department of Agriculture investigation, even if the Department of Agriculture clears the company. Hullum’s primary advice to these business owners is to be prepared. To learn more about Patrick Hullum’s practice, visit his attorney profile here.